Her decision to pursue a career in alternative medicine dates back to her teenage years, after an accident left her suffering with severe back pain. While medical doctors prescribed her painkillers, which only temporarily numbed the pain, Johanna sought treatment from a chiropractor to alleviate it. Experiencing for herself the benefits the body and mind have to gain from alternative health practices, she decided to go into this field to serve others with the same benefits chiropractic and acupuncture have provided for her. 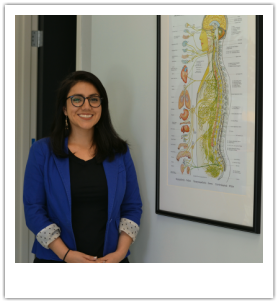 After practicing as a massage therapist at Carson Doctor’s Group for over 8 years, Dr. Johanna Martinez is excited to return as a practicing chiropractor and acupuncturist in her hometown of Carson, California. 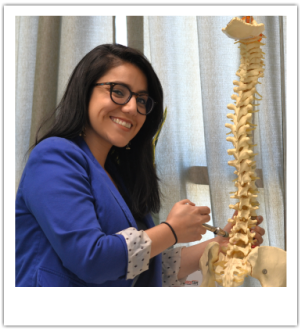 As part of a dual program, Dr. Johanna Martinez earned her Doctorate of Chiropractic in 2013 and Masters in Acupuncture and Oriental Medicine in 2014 at Southern California University of Health Sciences (SCUHS). ​During her time at SCUHS, she served as Treasurer for Activator Club and was an active participant of Healing Hands of Humanity. She was a participant in the 2012 Chiropractic Bolivia Mission Trip in the town of Cochabamba, Bolivia where free chiropractic services were provided to residents with limited access to healthcare. In April 2014, shortly after receiving her masters degree for Acupuncture and Oriental Medicine, she traveled to Kaohsiung, Taiwan where she interned for two weeks at Chung Ho Memorial Hospital and experienced first-hand the benefits of integrating western medicine with eastern medicine to treat a range of medical conditions such as brain damage, ADD, common flu, and weight loss among many other. We look forward to meeting you and help you in your journey to better health. We strive to provide quality Chiropractic and Acupuncture services to the community in a safe and comfortable place by helping the body to function at its optimal performance capability, and serve individuals as a whole, body, and mind.